"We will not rest until we destroy the Zionist entity"
"The annihilation of the Jews here in Palestine is one of the most splendid blessings for Palestine." A new fever has seized the media and the governments of some Western democratic countries  a belief that the world must now hold "talks" with Hamas and seek to reach an "accommodation" with this terrorist group. Hamas itself has been campaigning to be recognized as a legitimate governing body and removed from Western blacklists of terrorist movements. A number of European countries have already responded enthusiastically, thus becoming ventriloquist dummies for the far left, which long ago replaced PLO with the Hamas as the group it considers to be the "legitimate" representative of the Palestinian "people." "The European Union is right to demand the renunciation by Hamas of violence, and to demand that Hamas recognize Israel. But Europe also has to note that Hamas has stuck to a ceasefire since February 2005." Eight thousand rockets aimed at Jewish civilians do not count as violating any ceasefire in McMillan-Scott's opinion. The conservative (and anti-Semitic) BBSNEWS service has editorialized that the continuing regard of the Hamas as a terrorist organization "is probably THE most serious obstacle to peace [emphasis in original]." France has already conducted "talks" with Hamas, in which the terror group has been required to repudiate and concede nothing at all. American officials responded, "We don't believe it is helpful to the process of bringing peace to the region." Italian Prime Minister Romano Prodi called for negotiating with Hamas to help the movement "develop politically." Some British politicians chimed in with a solemn amen, including Tony Blair. A House of Commons Foreign Affairs Committee report recommended that lawmakers "urgently consider ways of engaging politically with moderate elements within Hamas." This of course makes exactly as much sense as seeking an accommodation with the moderate elements within al-Qaeda. Some have argued that EU dealings with Hamas themselves constitute a war crime. Ironically, members of the PLO have strongly denounced those Europeans calling for dialogue with its drival, which has now replaced Fatah in their affections. Nor is the EU content with merely talking. As journalist Caroline Glick writes, "... During the period when they were deployed at the [Rafah] terminal, the EU monitors turned a blind eye to the very terror traffic they were supposed to be preventing. At the same time, they condemned Israel for taking any action to defend itself and downplayed the threat Hamas constitutes for Israel. In short, the EU monitors sided with Hamas against Israel at every turn. The situation is much the same with UNIFIL forces in Lebanon." The tenured left in the United States has followed its European allies into embracing Hamas. Ostensibly devoted to secularist socialism, the left cheers the growth of Islamic fundamentalism in Hamas as the "genuine" and "authentic" representative of Palestinian opinion. Hamas banners now appear everywhere in "peace" demonstrations in Europe and North America. Leftists openly endorse the Hamas charter, whose central premise is that Israel must be annihilated. Hamas has become the epitome of radical chic on U.S. campuses. Noam Chomsky has been insisting that Hamas is more seriously interested in peace than is Israel. Former president of the Middle East Studies Association, Stanford's Joel Beinin, has criticized the Ford Foundation for not financing Hamas NGOs. Hamas, for its part, refuses to recognize or conduct any talks at all with Jews, even with the leftists in Israeli universities who ape the positions taken by Chomsky, Howard Zinn and other radical American academics. The attitude of the new American administration appears ambiguous. Secretary of State Hillary Clinton recently ruled out any American negotiations with the Hamas, but then added an ominous afterthought: "unless it meets certain conditions." Thus she took the first step towards joining the long list of Western diplomats who have backtracked and birdwalked over the past decade. These have methodically dumbed down the changes that Palestinian terrorists must make and the demands they must meet before being proclaimed "statesmen." Nor is Clinton alone in her incipient revisionism about Hamas. John Kerry, who now heads the Senate Foreign Relations Committee, recently paid a high-profile visit to the Gaza's Hamastan, and reportedly carried back a note from the terror organization for President Obama's eyes only. "A meeting with the former President of the United States lends credibility to terrorists and Holocaust deniers worldwide. In light of Hamas' continuing violence and calls for the destruction of the State of Israel, I strongly urge President Carter to reconsider his decision." Carter's pandering to Hamas is not reciprocal. In Hamas leaflets, the organization has expressed its opposition to every possible peace plan that has ever been proposed by anyone. In its leaflet #46 (September 1989) it rejected Egypt's ten-point peace plan and warned Palestinians against any contact at all with the United States. In its leaflet #55 (March 1990) it threatened other Palestinian figures who had met with former U.S. President Carter, and warned threateningly that those trying to revive the Camp David accords do not represent the Palestinian people. A bit more recently, Hamas ruled out any sort of permanent truce with Israel, other than brief ceasefires that can give it time to re- arm. "The logic of those who demand that we stop our resistance is absurd," the terror organization writes in one of its advisories that provide talking points for Western media and politicians. "They absolve the aggressor and occupier  armed with the deadliest weapons of death and destruction  of responsibility, while blaming the victim, prisoner and occupied." The word Hamas is an acronym for the Arabic words for "Islamic Resistance Movement." The organization is an Islamofascist terrorist group, responsible for most of the rocket terrorist attacks on civilians in Israel's south in recent years. Those attacks triggered Israel's Operation Cast Lead this past winter. It is estimated that 8000 rockets were fired before Israel at last retaliated. The Hamas "military" wing calls itself the Izz ad-Din al-Qassam brigades, named after an early Palestinian terrorist, killed by the British Mandatory government troops back when "Palestine" was governed by Britain. The Qassam rocket, the weapon of terror most favored by the Hamas, is also named after that terrorist. Al-Qassam was the sidekick of the Grand Mufti of Jerusalem, at the time Hitler's chief agent in the Middle East. Hamas is officially funded by Islamic fascist groups, by Arab governments, by Iran and Syria, and by "Islamic charities" from around the world. (The Bush administration famously cracked down on some of these "charities," including the so- called "Holy Land Foundation.) Hamas steals considerable portions of the aid provided to the Gaza Strip by the EU, the US, the UN, and by others. In some cases it then sells the material back to ordinary Gazans for a profit. Hamas grew out of the Palestinian wing of the violent fundamentalist Islamist movement calling itself the Muslim Brotherhood. The latter operated throughout the Muslim world, but was especially strong in Egypt, where it was launched in the 1920s. The Brotherhood served as an anti- British pro-Nazi terror group in Egypt and elsewhere during World War II. It terrorized the Jewish population of Egypt and in other Arab countries. It assassinated Anwar Sadat in 1981 for daring to sign a peace accord with Israel. It had earlier tried to assassinate Gamal Nasser for not being sufficiently anti-West and anti-Israel for their tastes. The Muslim Brotherhood regularly attacks non-Muslim tourists visiting Egypt and justifies any murder of non-Muslims by Muslims anywhere in the name of jihad. In 1973 a Muslim clergyman named Sheikh Ahmed Yassin established al-Mujamma' al-Islami (the Islamic Center) as the main Muslim Brotherhood movement in Gaza. In December, 1987, the same Yassin, who was later executed by Israel, founded Hamas as the Muslim Brotherhood's Gazan political arm. A different segment of the Muslim Brotherhood broke away to form the Islamic Jihad terrorist group, an ally of Hamas, in the mid-1980s. It did not take long for Israel to realize that the Hamas was arguably an even worse belligerent than the PLO. When Yassir Arafat and, after his death, Abu Mazen went through the motions of conducting "talks" and negotiations with Israel (as the price for receiving American and European support and financing), Hamas denounced such behavior, even though it was for the most part a diplomatic mime. Unlike the PLO, Hamas always speaks clearly and unambiguously in declaring its aims. Hamas is not even willing to pretend rhetorically that its ambitions can be met without the total annihilation of Israel and of its Jewish population. Hamas is openly endeavoring to carry out a new genocide of Jews. In one of its earliest proclamations, its Leaflet #65 (October 1990), it called upon Arabs to murder Jews and burn their property: "Every Jew or settler is a target and must be killed. Their blood and their property are forfeit." Not even the most desperate apologist for the organization can twist such statements to mean anything else. Hamas insists that "the soil of Palestine is sacred," and that every Muslim must take action to liberate every inch of Palestine from the Jews, by which it means all of Israel. Among the more notorious targets for its bombs have been buses of civilians and the cafeteria at the Hebrew University of Jerusalem. "The Islamic Resistance Movement believes that the land of Palestine is an Islamic Waqf [consecrated land held as an Islamic trust] consecrated for future Muslim generations until Judgment Day. It, or any part of it, should not be squandered: it, or any part of it, should not be given up. " "After Palestine, the Zionists aspire to expand from the Nile to the Euphrates. When they will have digested the region they overtook, they will aspire to further expansion, and so on. Their plan is embodied in the Protocols of the Elders of Zion, and their present conduct is the best proof of what we are saying." Moreover, in spite of the faddish mantras about Israeli "apartheid" heard on campuses these days, Israel is in fact the only country in the Middle East that is not an apartheid regime. No one knows just how many Palestinians the terror organization has killed. But Hamas is so dedicated to the liquidation of internal opposition that it took time out to murder the Fatah sympathizers in Gaza even while it was trying to fight off Israeli troops in Operation "Cast Lead" in 2008. Members of the PLO's Fatah are routinely accused by the Hamas of collaborating with Israel and tortured. Fatah members may not hold demonstrations in the Gaza Strip, even against Israel, and if they try to do so they are attacked by Hamas thugs. Even Amnesty International, no friend of Israel's, has spoken out against Hamas use of torture, although not against Hamas rockets fired at Jews. Even Arabs in Gaza hospitals have been tortured. The Hamas "parliament" has voted in favor of crucifixion of its opponents and rivals. Women deemed to be misbehaving in Gaza have been gang-raped by Hamas members. Hamas hates Christians, Bahais, and secular Muslims almost as ferociously as it hates Jews. It has brutalized Gaza Christians and ordered them to wear traditional Islamic dress. It has attacked churches in Gaza. In one incident its terrorists "attacked Gaza's Latin Church and adjacent Rosary Sisters School, reportedly destroying crosses, bibles, pictures of Jesus and furniture and equipment. The attackers also stole a number of computers." Other church leaders have been ordered at gun point to promote Islam. Until recently, about 2000 Arab Christians lived in Gaza, but many have fled for their lives, including the son of a Hamas member of parliament who converted to Christianity. A bit like Adolf Hitler in Germany in the 1930s, Hamas seized power in the Gaza Strip "legally" and only after winning an "election." On January 29, 2006, the organization defeated its rivals in a vote to take over the "Palestinian Authority, which had been set up by Israel in the euphoria of the early "peace process" under Yitzhak Rabin and with the expectation that it would be controlled by the PLO. After vote tallies, Hamas gained 74 out of 132 seats. It was not exactly a free election; for example, no party willing to recognize the legitimacy of Israel as a Jewish state was running, and no freedom of speech or of the press was in effect. Nevertheless, the strong showing of the Hamas effectively removed the PLO, the heirs of Yassir Arafat, from control of the Palestinian Authority. Whether the PLO and Hamas actually represent conflicting ideologies has long been a matter of dispute. They are both terrorist organizations devoted to Israel's annihilation. Abu Mazen, the "President" of the Palestinian Authority, wrote his "doctoral thesis" in Russia supporting Holocaust denial. The PLO has conducted suicide bombings and rocket firings, especially via its military "Al-Aqsa Martyrs Brigades." Hamas has done the same through its Izz ad-Din al-Qassam military. Their ideological differences matter about as much as the differences between warring mafia families and have to do with power and money far more than philosophy. After the 2006 election the initial expectation on the part of many observers was that Hamas would be content to allow Palestinian Authority President Abu Mazen to remain in power or at least to serve as a significant figurehead. But after biding their time a bit, Hamas militias launched a putsch to seize all centers of power in the Gaza Strip in the summer of 2007. The Fatah of the PLO put up a weak resistance and quickly fell apart. Many of its members requested that Israel "rescue them" and move them to safety in the West Bank. The Gaza Strip became popularly known as "Hamastan." The PLO retreated to its control of Palestinian institutions in the West Bank from its offices in Ramallah. There Abu Mazen heads an "alternative" Palestinian Authority, without the participation of Hamas, although the organization's loyalists control some of universities in the West Bank. It is not inconceivable that Hamas could displace the PLO in the West Bank just as it did in Gaza. One of the first things Hamas did after taking over Gaza was to launch a campaign of unbridled kleptocracy, stealing funds and commodities shipped to the Gaza Strip as humanitarian aid (including that sent by other Arab countries) sent via the UN institutions operating there. A Qatari newspaper claims the theft amounts to billions of dollars. This is all a bit ironic, given that Hamas favors the traditional Muslim punishment for theft of chopping off of hands. Aid is the main form of income and consumption in the Gaza Strip, where the terrorists have never had much interest in building factories or creating real jobs, other than employment opportunities in terrorism. (Among the items stolen by Hamas was the actual Nobel Peace Prize awarded to Yassir Arafat). Shakedowns by Hamas gunmen have included an attempt to kidnap the parents of Rachel Corrie, the undergraduate American cheerleader of terrorism turned martyr for the left, who was crushed in Gaza in 2003 when she refused to get out of the way of an Israeli bulldozer demolishing terrorist hideouts. When the terrorists realized whom they had grabbed off the Gaza street, they released them, as the anti-Israel Corries represented more valuable propaganda assets for terrorism while free. Imposing totalitarian power over the residents of Gaza by controlling the supply of food and other basic needs is part of Hamas' strategy. Intentional economic ruination is, in fact, de facto Hamas domestic policy  the creation of a situation in which every Gazan will be dependent upon Hamas handouts and Hamas control of international aid. The response of most of the world to this has been to escalate calls for providing even more aid to Gaza, channeled through Hamas. When Israel balked at providing supplies that would be commandeered by Hamas and used for its aims, especially while Hamas was firing thousands of rockets at Israeli children, the entire world wagged its fingers at the Israeli "oppressors denying food" meant for the poor children of the Gaza Strip. Israel was still denounced as an "occupier" of Gaza, even though it had removed all of its soldiers and civilians, because it was closely monitoring imports of supplies  and, often of arms  by Hamas. Meanwhile, Hamas also took control of the myriad smuggling tunnels that come into Gaza from Egypt, extorting "tolls" from other Gazans trying to use them to bring in supplies. The result of all this has been the emergence of two de facto separate Palestinian mini-states in the making  Hamistan, a Hamas-controlled Islamofascist state in the Gaza Strip; and a PLO-controlled entity in the West Bank some call Fatahstan. At this point the starting position of the Palestinians and their apologists in any negotiations is their demand for in effect four different Palestinian Arab states  the two mini-states in the making, as noted; plus Jordan, whose citizens are by and large Palestinians; plus the demand that Israel itself be converted into yet another Palestinian Arab state by allowing unlimited Arab migration to it as fulfillment of the supposed Arab "right of return." As soon as Hamas had seized power in the Gaza Strip, the world heard shrill declarations that this was an organization with which Israel and the West can "do business"  pragmatic people interested in jobs and budgets. It was claimed that, despite the group's lurid rhetoric and slogans and its menacing charter, once in office Hamas would devote all of its energies to praying, ecology, and fixing potholes. This assumption was delusional, as events soon demonstrated, but the love affair between the western left and Hamas persists. Rehabitating Hamas as a "Social Organization" and "Charity"
Hamas does indeed operate social services, but mainly as a tool in asserting its power and control, and in order to finance its terrorism. The American State Department has traditionally drawn no distinction between Hamas terrorism and its social services: "As long as Hamas continues to rely on terrorism to achieve its political ends, we should not draw a distinction between its military and humanitarian arms, since funds provided to one can be used to support the other." Even the normally anti-Israel Human Rights Watch has concluded that Hamas social functions are part and parcel of its terrorist activity: "In the case of Hamas, there is abundant evidence that the military wing is accountable to a political steering committee that includes Shaikh Ahmad Yassin, the group's acknowledged 'spiritual leader,' as well as spokesperson such as Ismail Abu Shanab, 'Abd al-'Aziz al-Rantissi, and Mahmud Zahar. Yassin himself, as well as Salah Shehadah, the late founder and commander of the 'Izz al-Din al-Qassam Brigades, have confirmed in public remarks that the military wing implements the policies that are set by the political wing." The Simon Wiesenthal Center has issued a report with the same findings. Hamas and al-Qaeda are basically two sides of the same jihad. They have squabbled rhetorically on occasion, such as over Hamas' meeting Putin, which bin Laden regarded as "betraying" the Chechins, but that may have been all for show. Hamas "schools" and other institutions routinely distribute the harangues of bin-Laden and other al-Qaeda materials. Hamas rallies feature posters of bin Laden and of Chechen terror leaders. Hamas terrorists returning from al-Qaeda camps in Afghanistan have been apprehended by Israel. Al-Qaeda emissaries have infiltrated Gaza to coordinate action with Hamas. 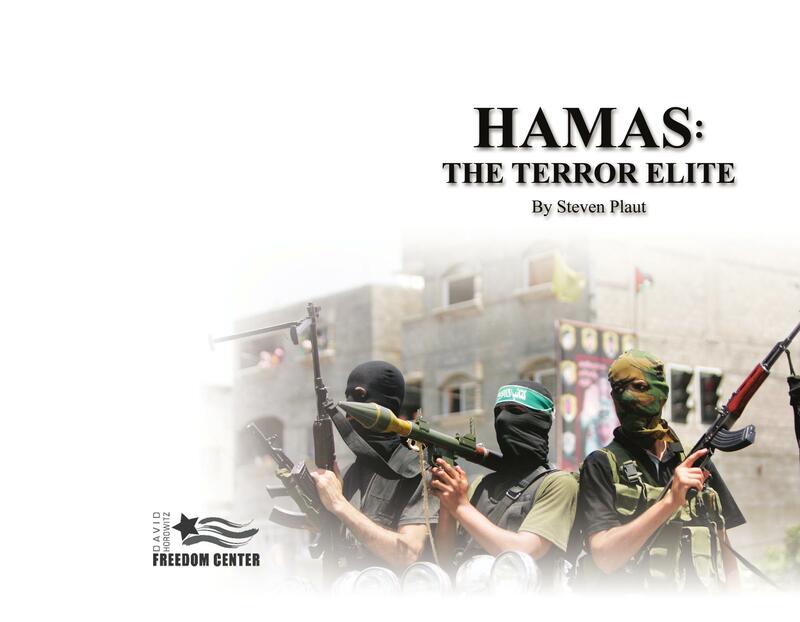 The San Francisco Chronicle reported, "According to a 2004 FBI affidavit, al-Qaeda recruited Hamas members to conduct surveillance against potential targets in the United States." In 2006, Palestinian Authority President Mahmoud Abbas, better known as Abu Mazen, himself claimed that al-Qaeda was operating in the Gaza Strip and also accused Hamas of providing aid to al-Qaeda.. A group calling itself the "Al-Qaeda Organization Jihad in Palestine" has operated in Gaza since October 2005 with Hamas blessings. Hamas has long been unabashedly anti-American. The FBI has been warning about possible imminent Hamas attacks on America since at least 2005. Saddam Hussein was one of the main funders of Hamas, making grants to the families of Hamas suicide bombers. Hamas strongly denounced the arrest and execution of Saddam by the US, calling it a "political assassination." A Hamas spokesman, Fawzi Barhum, said, "Saddam Hussein was a prisoner of war. [The] hanging ... is a political assassination that violates all international laws that are supposed to protect prisoners of war." Several Hamas operatives have been arrested in the U.S.
Hamas is also one of the most openly anti-Semitic organizations on the planet. It repeats every medieval anti- Jewish libel, down to and including the use of the blood of gentile children to make Passover bread. It recently claimed that a Jewish world cabal had engineered the current collapse of financial markets. Hamas' role in spreading anti-Semitism goes well beyond the Middle East. It has distributed anti-Semitic materials in Russia, including, oddly enough, the old czarist forgery, The Protocols of the Elders of Zion. Hamas owes much of its growth to the support it receives from Iran. Israel's ex-Prime Minister Olmert recently said, "Hamas in Gaza was built by Iran as a foundation for power, and is backed through funding, through training and through the provision of advanced weapons." The moment Hamas won the Gaza "elections" in 2006, Iran rushed in to compensate for the dismay of the rest of the world. Hamas and Iran had already grown very close in the aftermath of the American-led allied invasion of Iraq in 2003. That closeness may seem odd, since Iran today leads the world's Shi'ite Muslims, with their centuries of grievances against Sunni Muslims, while Hamas is clearly a Sunni entity. But the alliance makes sense when the third leg of this triangle of terror, the Shi'ite Hezbollah in Lebanon, which collaborates openly with Hamas, is factored into the equation. When the Hamas leaders are not busy denying there ever was a Nazi Holocaust of the Jews, they are insisting that the Jews planned the Holocaust themselves. A Hamas film made public by the Palestinian Media Watch organization claims that Jewish leaders themselves orchestrated the European Holocaust of Jews, "so the Jews would seem persecuted and try to benefit from international sympathy." Amin Dabur, head of the "Center for Strategic Research," is cited in the film explaining that "the Israeli [sic] Holocaust, the whole thing was a joke and part of the perfect show that Ben Gurion put on.... They were sent [by the Jews to die] so there would be a Holocaust, so Israel could 'play' it for world sympathy." CAIR is an anti-Semitic, anti-American lobby group with intimate ties to Hamas, and is sometimes considered to be an outright subsidiary of Hamas. Americans Against Hate, in fact, has called upon the US government to regard CAIR as an official front for Hamas. CAIR itself was established in June, 1994 by three leaders of the now-defunct American propaganda wing of Hamas, the Islamic Association for Palestine (IAP). That group was part of the American Palestine Committee, headed by the global leader of Hamas, Mousa Abu Marzook. In March, 1994 CAIR's co-founder and current Executive Director, Nihad Awad, stated in broken English, "After I researched the situation inside and outside Palestine, I am in support of the Hamas movement..."
CAIR disseminates Hamas propaganda, including its calls for genocide against Jews. CAIR members have bragged that they plan to become suicide bombers. The FBI recently cut off all contact with CAIR, in part because of its intimate ties with Hamas. CAIR was named an unindicted co-conspirator in the plot by Islamists in the US, led by Sami al-Arian (a founder of CAIR), to raise funds for Hamas. The CAIR Research Director, Mohammad Nimer has ties with terrorists. He also served as a board director for UASR, the strategic arm for Hamas in the U.S. According to his bio at American University, "Just as CAIR uses the facade of being a civil rights group to conduct terror activities, Nimer used the guise of "conflict resolution" expert to facilitate his movements within the al-Qaeda network." The Western fetish about "talking," which has been analyzed at length by Joshua Muravchik, is based on the belief that all international conflicts and wars resemble marital spats. Thus the trick to settling them is to smooth ruffled egos and get the conflicted parties to sit down face to face, socialize over tea, emote, seek catharsis, and otherwise come to empathize with the "Other." It is postmodernist gibberish and Habermasian "communicative action" gone berserk. It is based on the naïve belief that everyone in the world is reasonable, and so all conflict must be the result simply of misunderstanding. Proponents insist that there are no real conflicts of interests, just misinterpretations and hurt feelings. Grievances are mere psychological baggage, always ready to be jettisoned. "As the Gaza war moves to a cease-fire, a crucial question will inevitably arise, as it has before: Should Israel (and by extension, the United States) try to engage Hamas in a substantive and sustained manner? It is a fair question, one worth debating, but it is unmoored from certain political and theological realities.... Periodically, advocates of negotiation suggest that the hostility toward Jews expressed by Hamas is somehow mutable. But in years of listening, I haven't heard much to suggest that its anti-Semitism is insincere. Like Hezbollah, Hamas believes that God is opposed to a Jewish state in Palestine. Both groups are rhetorically pitiless, though, again, Hamas sometimes appears to follow the lead of Hezbollah." The bottom line is that there is no possibility of reaching any "deals" or even real ceasefires with Hamas, which has violated every single ceasefire agreement it ever signed within minutes. It was the fact that Hamas launched thousands of rockets at Israel in the first place, while a ceasefire agreement was supposed to be in effect, that led to the recent Gaza war. No deal is possible because there is nothing Hamas seeks other than war. Therefore there can be no possibility for any tradeoffs or compromises that might be proposed to Hamas as compensation for its giving up or forestalling its genocidal ambitions. Since war is its raison d'etre, there is absolutely nothing constructive that can be gained by offering Hamas dialogue and negotiations. The only real effect of such "talks" would be to strengthen Hamas, strengthening its legitimacy among credulous European and American liberals, and so give it added leeway to continue its quest for a second Holocaust of Jews. 4 "EU Urged: Take Hamas Off Blacklist," The New York Times, May 20, 2008. 6 "At Tufts, Blair says Hamas must be drawn into talks," Boston Globe, Feb. 3, 2009. 29 "Amnesty charges Hamas with torture and murder,"
46 'Rachel Corrie's parents endure brush with Gaza kidnappers,' Jerusalem Post, Jan 5, 2006.
http://www. worldnetdaily.com/news/article.asp?ARTICLE_ID=59026; "CAIR: Youngest Member of Hamas Family Tree,"
67 "Feds name CAIR in plot to fund Hamas,"